Amongst all of the animals facing extinction in the world currently, perhaps the most interesting are those that share relatively recent ancestors (and many, many, many behaviors and social patterns…) with us — that is to say, other primates. The greater apes, the lesser apes (gibbons), the monkeys, the baboons, the lemurs, the tarsiers, the bush babies, etc. The vast majority of these animals (across all of their various families, genera, and species) have seen their numbers plummet in recent years — largely owing to the incredible rates of habitat destruction seen over recent years, via deforestation, desertification, and encroaching human settlements. Based on current fossil evidence the earliest known primate (Teilhardina) lived around 55.8 million years ago. 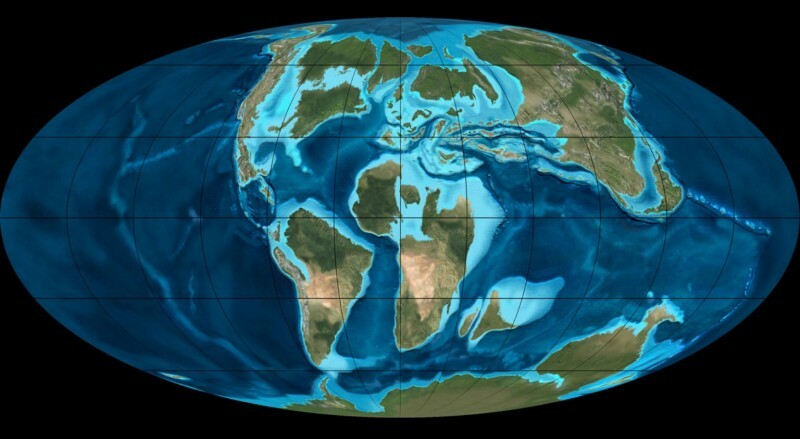 But other lines of enquiry (along with the general rareness of small-animal fossils from that far back) suggest that primates probably emerged ~85 million years ago, in the mid-Creataceous era — with evidence pointing toward an origin in what would now be considered to be a part of Asia (of course, the land masses of the world back then were connected in very different ways). Since that relatively long ago origin in the tropical forests of a very different world, inhabited by very different forms of life, primates have spread out across a great many different environments and ecological niches. Diversifying into the mountain-living gorillas, the shellfish-smashing Burmese macaques, the tree-sap-loving marmosets, the grass-eating geladas, the war-like chimps, the fishing-by-hand long-tailed macaques, the kills-bush-babies-with-sharpened-spears chimpanzees (they use stone hammers as well), the hot-spring loving snow monkeys (Japanese macaques), the jet-engine-loud howler monkeys, etc, of today. And, also, into the pack-living (chimpanzees, many monkey species), the crowd/troop living (baboons, geladas), the nuclear-family-like (gorillas), the pair-bonded (gibbons), and the largely solitary (orangutangs/orangutans), social structures seen today. Many of the species to which these highly-diverse behaviours and ways of living are embodied by are now considered to be endangered — largely owing to human activity over the last few thousand years. And, in particular, over the last few hundred years. Below I’ve made a list of some of these now endangered animals — providing interesting facts, images, and anecdotes. Enjoy. The mountain gorilla (Gorilla beringei beringei) represents one of two known subspecies of the eastern gorilla. There are currently only two population of this subspecies still extant in the world. One of these is found in the Virunga volcanic mountains of Central Africa, and the other in Uganda’s Bwindi Impenetrable National Park. There’s some debate about whether these two populations are actually separate subspecies or the same one. Even when the two populations are taken together, there are — as of November 2012 — only ~880 individuals of the species left in the wild. Evidence suggests that the ancestors of gorillas split-off from the evolutionary line that would go on to diverge into chimpanzees and hominids (including humans) roughly 9 million years ago. Mountain gorillas split-off from the other eastern gorilla (sub)species roughly 400,000 years ago — and the eastern gorillas split off from the western ones roughly 2 million years ago. Mountain gorillas, as you can probably guess, are well-suited to life in the colder mountain regions of central Africa — in particular, their fur is notably thicker and longer than in other gorillas. Males of the type typically average a weight of 430-490 lbs and 5’6-5’9. Females typically average 220 lbs in weight and are notably shorter. Individuals can be much larger than this though — silverbacks regularly reach 6’3 in height (7’7 arm-span) and 490-500 lbs. The tallest confirmed mountain gorilla on record was 6’4 (shot in 1938) and the heaviest was 586 lbs (shot more recently). Unconfirmed reports from 1932 report of one that measured 6’9 in height. Owing to their great bulk, mountain gorillas spend a substantial portion of their days eating. The typical “schedule” seen in the wild sees foraging in early morning, followed by an early-afternoon rest, followed by more feeding until night, and then overnight rest. Mountain gorillas build new (rather elaborate) nests to sleep in every night from surrounding vegetation. While they typically wake with the sunrise, on colder and overcast-days they tend to linger longer in their nests before leaving. 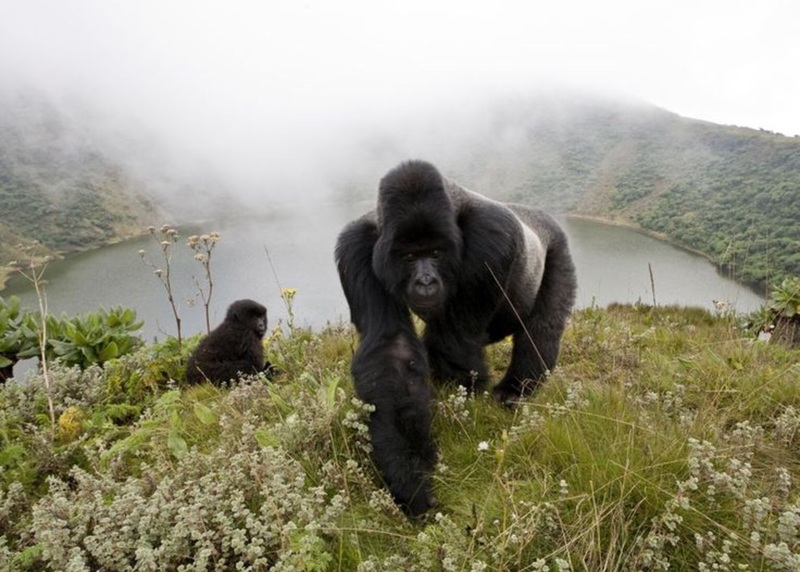 The mountains that the mountain gorillas live in range from 7,200–14,100 feet in height. The forests where the subspecies live are often quite misty and cloudy, in addition to the relative cold. Males will typically consume as much as 75 lbs of vegetation in a single day, while females typically consume ~40 lbs a day. Travel is often dependant upon what time of year it is — for example, during the few months when fresh bamboo shoots are available, they will often travel to the bamboo forests to feed. They also regularly climb well into the subalpine regions of the mountains to feed on the soft centers of giant senecio trees. The majority of males leave the group that they are born into, and roughly 60% of females do as well. Males typically leave when they are around 11 years of age — it isn’t an abrupt happening though, they generally separate themselves slowly, simply spending more and more time away from the group, until they leave completely. The dominant silverback generally determines the movements of the group, leading it to appropriate feeding sites throughout the year. He also mediates conflicts within the group and protects it from external threats. When the group is attacked by humans, leopards, or other gorillas, the silverback will protect them even at the cost of his own life. He is the center of attention during rest sessions, and young animals frequently stay close to him and include him in their games. If a mother dies or leaves the group, the silverback is usually the one who looks after her abandoned offspring, even allowing them to sleep in his nest. This is a form of alloparental care which is a common behavior and is seen in many other animal species such as the elephant and the wolf. Experienced silverbacks are capable of removing poachers’ snares from the hands or feet of their group members. When the dominant silverback dies or is killed by disease, accident, or poachers, the family group may be severely disrupted. Unless he leaves behind a male descendant capable of taking over his position, the group will either split up or be taken over in its entirety by an unrelated male. 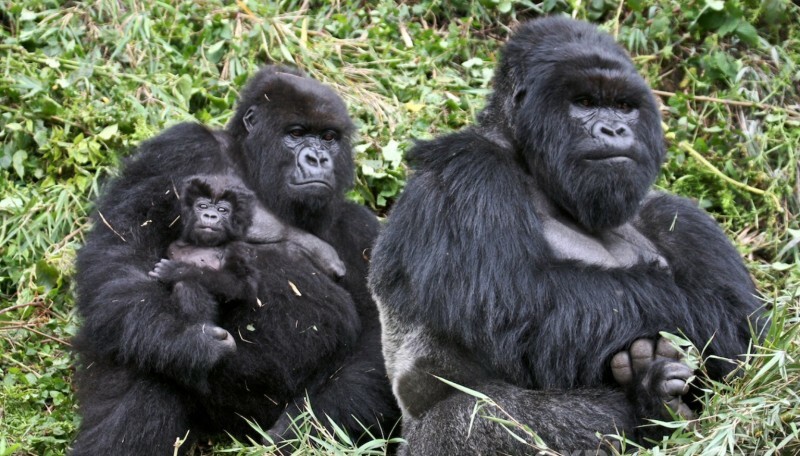 When a new silverback takes control of a family group, he may kill all of the infants of the dead silverback. Infanticide has not been observed in stable groups. Despite their image in the popular imagination, gorillas are actually far-and-away one of the least violent primates out there. The exception to this is that sometimes when two mountain gorilla groups meet, there is often friction. The silverbacks of the two groups will sometimes even fight to the death. Interestingly, in the run-up to a potential fight the dominant silverbacks will often perform what’s been termed “symbolic feeding” — potentially making it clear to the other silverback that this feeding ground is theirs? Mountain gorillas face a very uncertain future owing to their very limited numbers and continuing pressures resulting from human activity. Mountain gorillas are not usually hunted for bushmeat, but they are frequently maimed or killed by traps and snares intended for other animals. They have been killed for their heads, hands, and feet, which are sold to collectors. Infants are sold to zoos, researchers, and people who want them as pets. The abduction of infants generally involves the loss of at least one adult, as members of a group will fight to the death to protect their young. The Virunga gorillas are particularly susceptible to animal trafficking for the illegal pet trade. With young gorillas worth from $1000 to $5000 on the black market, poachers seeking infant and juvenile specimens will kill and wound other members of the group in the process. Those of the group that survive often disband. One well documented case was that known as the ‘Taiping 4’. In this situation, a Malaysian Zoo received four wild-born infant gorillas from Nigeria at a cost of US$1.6 million using falsified export documents. Poaching for meat is also particularly threatening in regions of political unrest. Most of the African great apes survive in areas of chronic insecurity, where there is a breakdown of law and order. The killing of mountain gorillas at Bikenge in Virunga National Park in January 2007 was a well documented case. 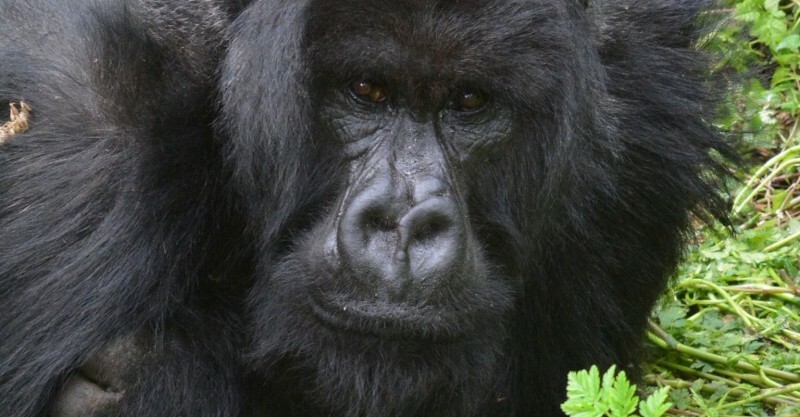 Habitat-loss is one of the most severe threats to gorilla populations. The forests where mountain gorillas live are surrounded by rapidly increasing human settlement. Through shifting (slash-and-burn) agriculture, pastoral expansion and logging, villages in forest zones cause fragmentation and degradation of habitat. The late 1960s saw the Virunga Conservation Area (VCA) of Rwanda’s national park reduced by more than half of its original size to support the cultivation of Pyrethrum. This led to a massive reduction in mountain gorilla population numbers by the mid-1970s. The resulting deforestation confines the gorillas to isolated deserts. 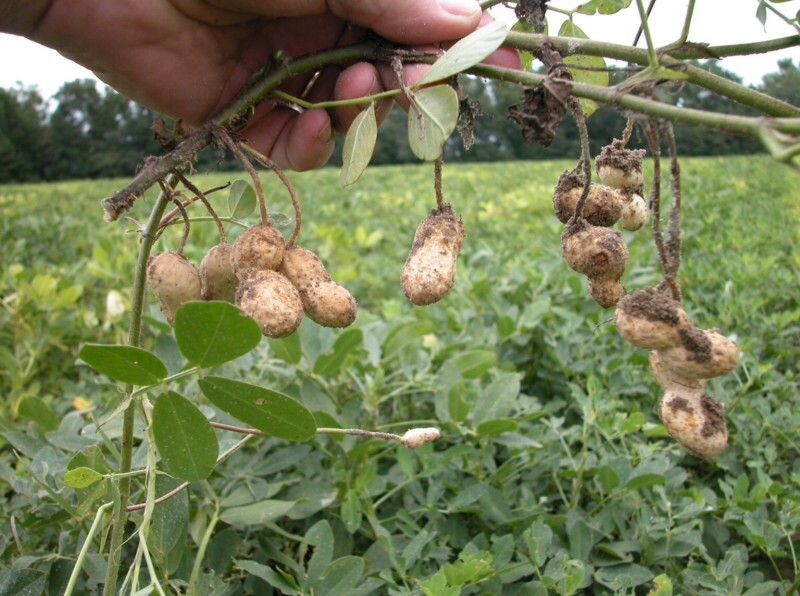 Some groups may raid crops for food, creating further animosity and retaliation. The impact of habitat loss extends beyond the reduction of suitable living space for gorillas. As gorilla groups are increasingly geographically isolated from one another due to human settlements, the genetic diversity of each group is reduced. Some signs of inbreeding are already appearing in younger gorillas, including webbed hands and feet. With deforestation in the area looking likely to become more-and-more of a problem over the coming years, and human populations to continue growing, the future of the mountain gorillas doesn’t look good. 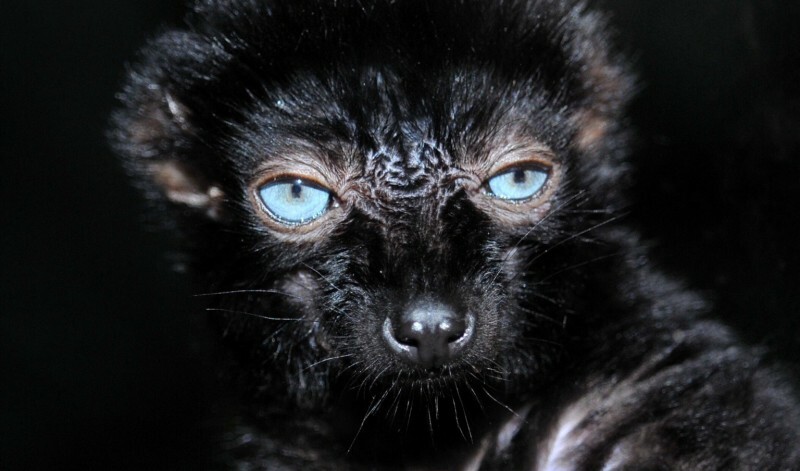 The Blue-Eyed Black Lemur (Eulemur flavifrons) is a species of true lemur that is native to the sub-tropical moist and dry forests in the northwestern tip of Madagascar. Like all “true lemurs” the species is only found in Madagascar — the true lemurs are a branch of primates that diverged from the other primates over 50 million years ago, they are completely unrelated to the various species of non-primates native to Southeast Asia commonly referred to as “lemurs”. As you can probably surmise from the wonderful photo above, they are a “highly aggressive” species, with infighting between various troop members being fairly common during the breeding and birthing seasons. Also, interestingly, they are known to practice infanticide against other species of lemurs, even ones that seemingly occupy very different ecological niches — needless to say this behavior is a very rare one, the blue-eyed black lemur being one of the only species to be observed practicing it. Something else that the photo above can tell you is that the species possesses very striking blue eyes — they are in fact one of only a few species of primates that is regularly born with blue-eyes. They also happen to be sexually dichromatic — which means that the males and females of the same species possess different hair/coat colors. The males possessing dark-black fur, and the females a reddish-brown fur. The species usually reaches body-sizes of between 90–100 cm when fully grown, with an average weight of between 1.8-1.9 kgs. Like almost all primates, they possess very strong hands that possess a good deal of articulation. The blue-eyed black lemur hasn’t been studied extensively in the wild, but it’s known that it is a fairly social species — living in groups that usually consist of 4-11 individuals. Though larger troops are known. Females are dominant over the males (as is true in many lemur species), but there are usually more males than females in a troop. The females typically give birth in June or July — following a ~4 month long pregnancy. The young are weaned at about 6 months of age, and reach maturity at two years of age. How long they tend to live while in the wild is a bit of a mystery, but in captivity they are known to live between 15-30 years on average. Very interestingly, they possess what’s known as a cathemeral activity pattern, being awake sporadically on-and-off throughout the day. Nighttime wakefulness seems to tied heavily to the intensity of moonlight at any given time. Communication within the species is primarily through various types of vocalizations (grunts, chirps, barks, “screes”, and clicks), facial expressions, and scent-marking. 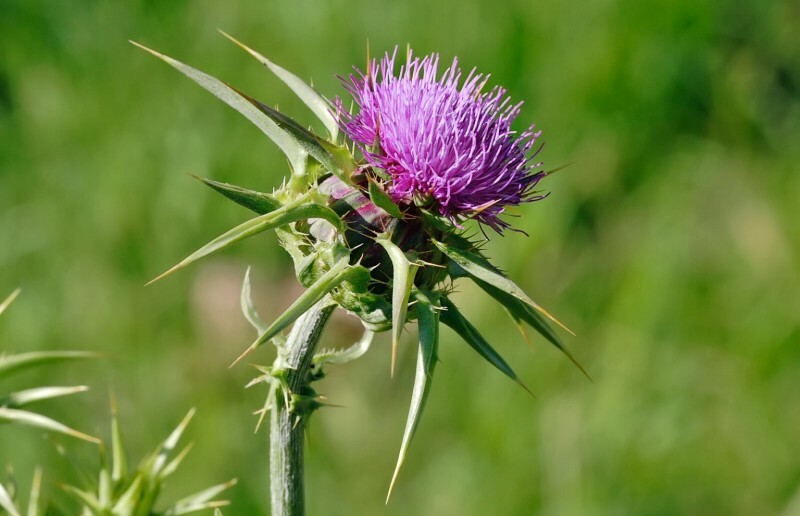 The diet is made up, primarily, of fruits, nectar, pollen, leaves, berries, and the occasional insect. 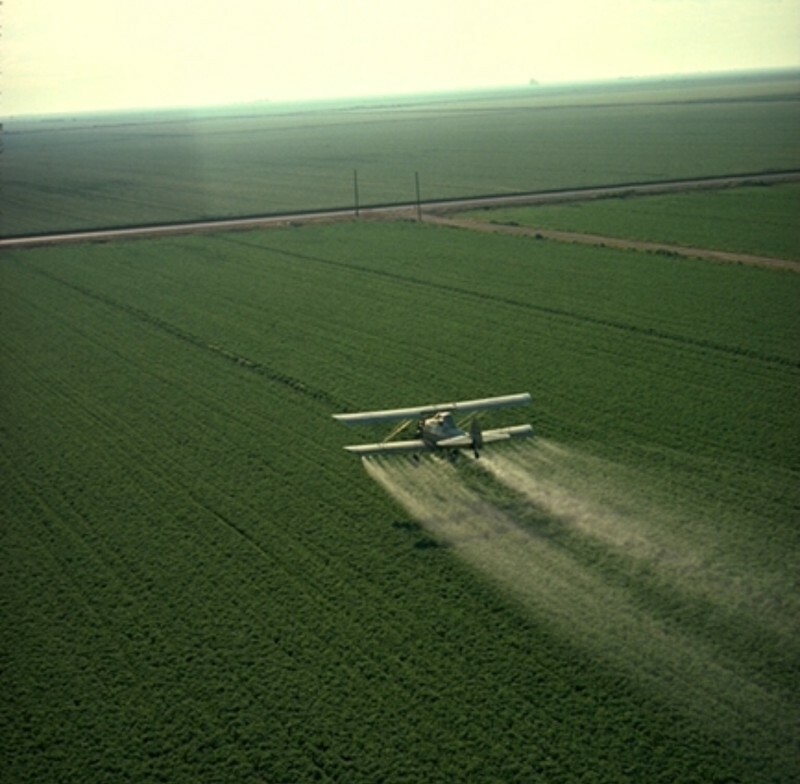 They’re known to occasionally raid farmlands for crops — leading to them being shot regularly. Owing to the incredible degree of deforestation that has taken place in Madagascar during the last few decades, the species is rapidly approaching extinction — the animal’s habitat is, to put it simply, nearly gone. The blue-eyed black lemur is currently listed as being critically endangered — with less than 1,000 individuals thought to exist in the wild. The orangutang (variously known as the orangutan) is probably one of the most instantly recognizable species of primates in the world currently. The highly distinct-looking animal is of course quite a close relative of humans — and shares a great, great many behavioral and social patterns with us. The common name actually refers to two distinct species — the Bornean orangutan (P. pygmaeus) and the Sumatran orangutan (P. abelii). Based on best evidence, these species seem to have diverged from a common ancestor species roughly 400,000 years ago. The orangutans are the only surviving species of the subfamily Ponginae — which previously included several other species. The ancestors of this subfamily split off from the other ape species roughly 16-19 million years ago (there’s actually a fair amount of debate about these dates though, it’s worth noting). Out of all of the great apes, orangutans are the most arboreal — spending a large portion of their lives in trees, though this varies a fair amount based on which population/culture is in question. As far as looks go, they possess very distinctive reddish-brown hair — in stark contrast to the darker hair typical of chimpanzees and gorillas. The species is highly sexually dimorphic — with the dominant males (the ones with their own territory) having very distinctive faces featuring large cheek pads and throat pouches. These features develop in males rapidly when, and if, they gain their own territory. While females generally only willingly mate with the dominant males, males without territory still (typically) regularly successfully mate with females via coercion. They are, as far as primates go, quite solitary — though there is still, most certainly, a fair amount of social behavior as well. The species is most definitely one of the smartest of all the primates — with highly sophisticated tool-use, highly elaborate and skilled nest-building, and a highly developed memory, being the norm for the species. Distinctive cultures are also easily discernible in the species, and much cultural knowledge appears to be passed on to the young early in life. 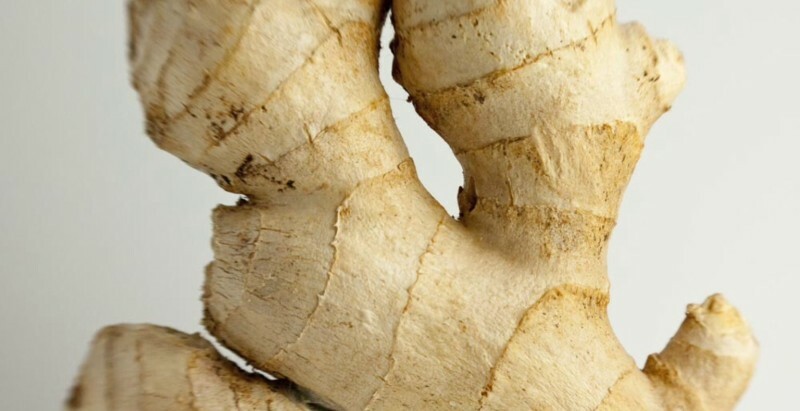 The orangutan diet seems to generally be based mostly around fruit, but they eat a wide variety of other foods as well — including greens, honey, insects, bird eggs, and bark. They typically live to be over 30 years old in the wild. The two species are both currently considered to be endangered — with the Sumatran orangutan being classified as Critically Endangered. The primary cause of the species decline in recent years, of course, human activity. In particular, wide-scale deforestation, poaching, and habitat destruction. The illegal wildlife/pet trade has also played a factor though. The red-faced spider monkey is a species of New World Monkey that lives in some regions of the northern part of South America. The species possesses a distinctive bright red or pink face, but is otherwise covered nearly completely in long, dark hair. Interestingly, the species is actually born with rather dark faces which then lighten as the monkey ages, there isn’t much sexual dimorphism in the species — males and females are of roughly the same size and weight. The animals possess a prehensile tail (can grasp with it), and have strong, agile hands well-suited for climbing. 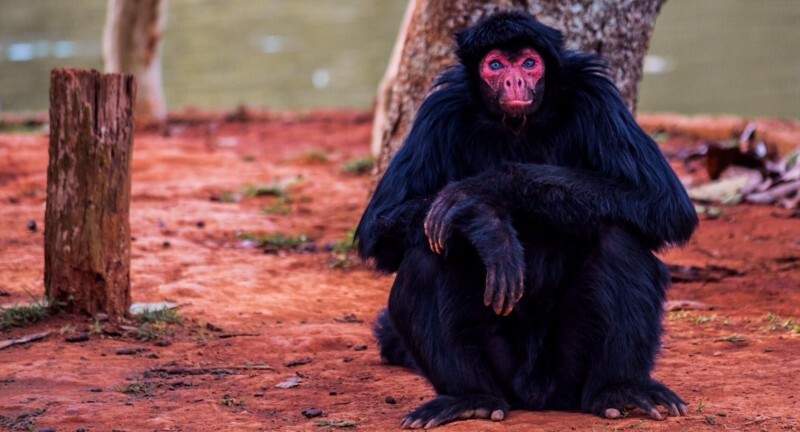 The red-faced spider monkey lives in what’s been termed as a fission-fusion society — which is to say, during the day the travel and forage and socialize in relatively small groups, but congregate together at night in large numbers. These fusions of various groups usually consist of several females with their young, with a “few” males sleeping on the perimeters for protection. The diet of the red-faced spider monkey is rather varied, but is overall considered to be that of an omnivore — leaves, fruits, termites, grubs, other insects, flowers, berries, etc, are the favored foods. The species possesses a gestation period of between 226–232 days typically — and infants are usually weaned between 4-5 years of age, after reaching sexual maturity. Lifespan in the wild is unknown, but in captivity they are known to live to be at least 33 years old. The species is facing significant threats to its survival as a result of deforestation, over-hunting, and other forms of habitat loss. It’s currently listed as being Vulnerable on the IUCN Redlist. The population of giant, possibly lion-hunting, chimpanzee subspecies popularly known as the Bili Apes is restricted in range to the relatively remote Bili Forest of the Democratic Republic of the Congo. As the name implies, there’s a fair amount of anecdotal evidence that this subspecies actively hunts and eats various otherwise predatory animals. In particular, there was an interesting occurance a few years back where a researcher in the area came across a large male eating what appeared to be a freshly killed leopard, after hearing loud disturbances a few hours previously. Despite the apparent hunting-prowess of the subspecies, there’s only so much that such an animal can do against encroaching bands of gun-toting illegal gold-miners, bushmeat hunters, and poachers. The region where these chimpanzees live, the Bili Forest, is still relatively remote, but in recent years human activity has been increasing rapidly. Over a 14-month period between September 2007 and November 2008, researcher Cleve Hicks and his Congolese assistants documented 34 chimpanzee orphans and 31 carcasses for sale in the nearby Buta – Aketi – Bambesa region (seven of the orphans have been confiscated and adopted). Laura Darby and Adam Singh have seen another nine chimpanzee orphans and three carcasses in Aketi, Buta, and Bondo, since Hicks left in November. In addition, Hicks observed a large quantity of okapi and leopard skins along with elephant meat and ivory. It is likely that this exploding bushmeat trade is now making its way into the Bili region with the gold miners. Tarsiers are something of a “branch-way-off-to-one-side” as far as primates go — being members of the family Tarsiidae, which is itself the only still-living family within the infraorder Tarsiiformes. This wasn’t always the case though (of course) — the animals were once quite common throughout South Asia — but as it stands now, all of the remaining species now live on just a handful of islands in the region. Tarsiers are very distinct looking animals — with their enormous eyes, human-like hands, and almost stuffed-animal-like body, it’d be hard to mistake them for anything other than what they are. The animals possess an “incredibly strong auditory sense” owing to its very distinct auditory cortex, along with the ears of course. Despite their looks, they’re quite strong for their size – and are well-suited towards climbing and leaping. Tarsiers apparently possess a brain-structure that is quite different from other primates, especially with regard to the arrangement of the connections between the two eyes and the lateral geniculate nucleus — the main region of the thalamus that receives visual information. 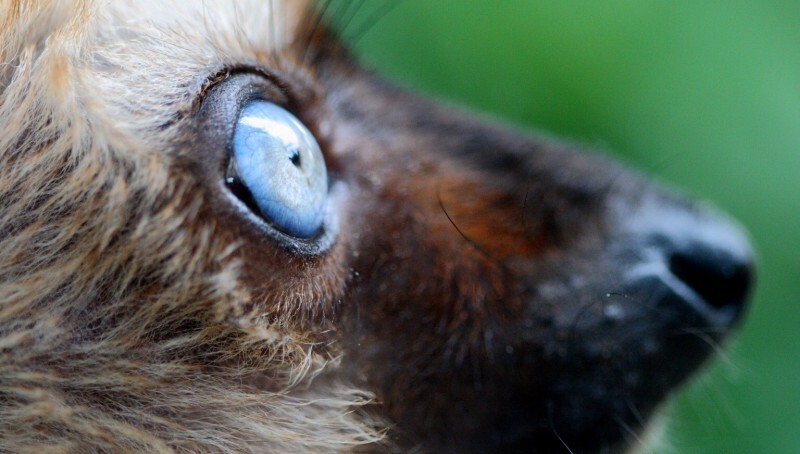 The sequence of cellular layers receiving information from the ipsilateral (same side of the head) and contralateral (opposite side of the head) eyes in the lateral geniculate nucleus distinguishes tarsiers from lemurs, lorises, and monkeys, which are all similar in this respect. Some neuroscientists suggested that “this apparent difference distinguishes tarsiers from all other primates, reinforcing the view that they arose in an early, independent line of primate evolution. Some of the tarsier types that live in the Philippines can hear frequencies as high as 91 kHz — and can vocalize with a dominant frequency of 70 kHz. They are the only still-living type of primate that is primarily carnivorous — in this case carnivorous refers to being mostly insectivorous. They catch insects primarily by jumping at them from an ambush. While they seem to live mostly on insects, they are also known to prey on larger animals, such as: snakes, bats, birds, and lizards. As mentioned before, when in their natural habitats tarsiers are always nocturnal — but captive ones may display daytime wakefulness (not surprising considering how noisy zoos are). Gestation usually lasts ~6 months. Social behaviors and systems vary widely based on the species — with some species living in family groups, and some species living primarily solitary lives. Tarsiers are poorly suited towards captivity — in fact, there has not once been the successful creation of a captive “breeding colony”, despite many decades of effort. 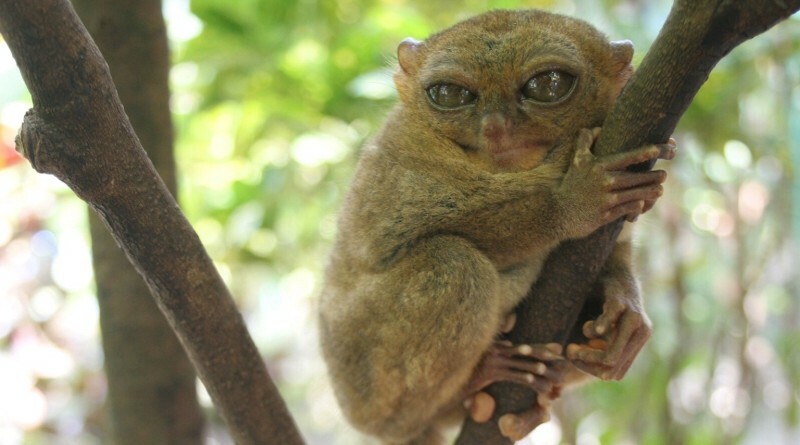 All tarsier species are currently listed as being “Vulnerable” — with a number of specific species being listed as Endangered or Critically Endangered. The bald-headed uakari (Cacajao calvus) is a species of New World monkey best recognized by its bright crimson-red face, and long coat. The species currently only exists in the várzea forests (and other wooded habitats near water) of the western Amazon (Brazil + Peru). The bright-red faces of the bald uakari are down to the fact that said faces are completely lacking in skin-pigment, and are fed with blood by very plentiful capillaries. The species is arboreal and lives primarily in seasonally flooded forests that surround portions of the Amazon River Basin. They stay in the trees during the flood season, but return to the ground to forage during the dry season. 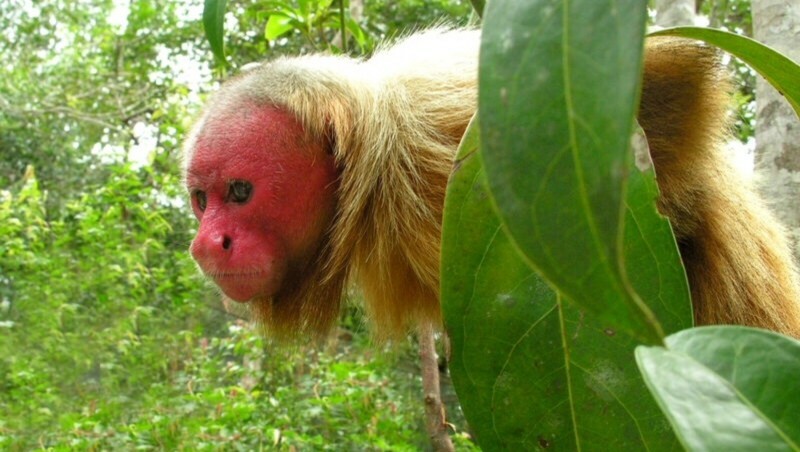 Research has shown that the diet of the uakari consists of, roughly: 67% seeds, 18% fruit, 6% flowers, and 5% animal prey. The species possesses a powerful jaw structure, allowing it to open-up unripe fruits, and also to eat nuts that most other primates can’t. The species is known to travel long-distances throughout the day — even traveling as much as 3 miles per day. Travel is typically done in groups of between 5-30 individuals — but these groups can be as large as several hundred individuals in size. Males typically leave the groups that they are born into. The brighter the red color of the face is, the healthier the monkey is, generally — so it’s thought that the red faces evolved as a means of easily assessing the health of potential mates. The lifespan of wild individuals isn’t currently known, but individuals in captivity are known to live to be over 30 years of age. The species has seen its numbers decline by at least 30% over the past 3 decades owing to deforestation, over-hunting, and habitat-loss via other processes. The Lar gibbon (Hylobates lar) is one of the best known species of gibbon (lesser-apes) — and as a result is often caught for the purpose of stocking zoos and feeding the illegal wildlife/pet trade. The species can possess any number of different coat-colorings. Males and females of the species don’t vary noticeable in size or coloring. 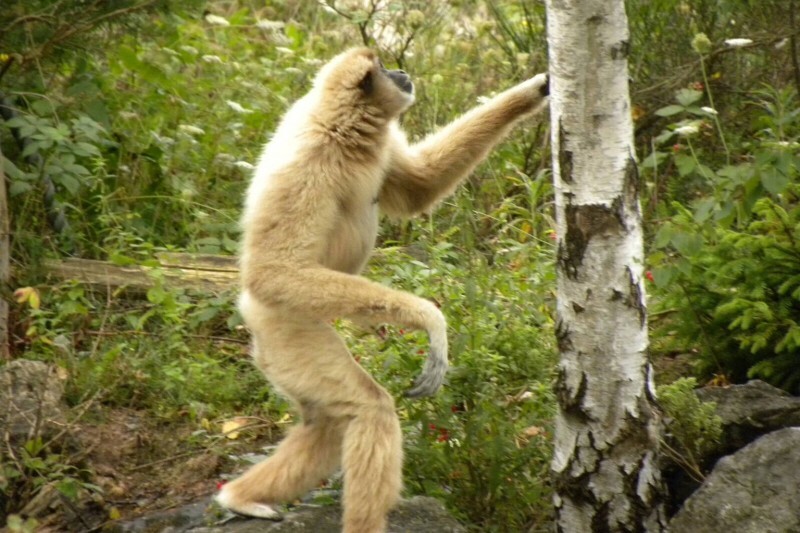 Like other gibbons, the Lar gibbon travels primarily by swinging from tree branches, but is also known to spend time traveling on the ground as well. The species is currently found throughout Indonesia, Thailand, Laos, Malaysia, and Myanmar — but historically they lived as far north as China, and had a much larger territory in every other direction as well. The species is largely frugivorous with fruit making up roughly 50% of its diet — but their diet also includes leaves (29%), insects (13%) and flowers (9%). They are also known to occasionally poach bird eggs. Despite their diet, the species possess large, highly-sharp canines in both jaws — used primarily for defense and competition apparently. The average day of a lar gibbon see its spend roughly 32.6% of its time feeding, 26.2% of its time resting, 24.2% of its time traveling, 11.3% of its time socializing, 4.0% of its time vocalizing/singing, and 1.9% of its time on intergroup encounters. Of course, these numbers are generalizations — they vary greatly depending on a great many factors. When on the ground they actually walk bipedally like people — though they generally place their arms over their head for balance. Gibbons are unusual amongst primates for their regular practice of pair-bonding — something that isn’t often seen in primates, being more of an avian thing. Their social organization is dominated by monogamous family pairs, with one breeding male and one female along with their offspring. When a juvenile reaches sexual maturity, it is expelled from the family unit. Family groups inhabit a firm territory, which they protect by warding off other gibbons with their calls. Each morning, the family gathers on the edge of its territory and begins a “great call”, a duet between the breeding pair. Each species has a typified call and each breeding pair has unique variations on that theme. The great call of Hylobates lar is characterized by its frequent use of short hoots with more complex hoots, along with a “quavering” opening and closing. Mating goes on year-round, but conception typically only happens during the dry-season. Most births seem to occur in, or right around, the month of October. Lar gibbons usually reach full maturity by the age of 8 or so — with a life expectancy of 25 years in the wild. While they aren’t currently considered to be “endangered”, deforestation, hunting, and the illegal pet trade are all having an effect on population numbers. The population has fallen significantly — and become highly fragmented — over the last few decades. Geladas (Theropithecus gelada) are the only still-extant species in their genus (Theropithecus), but larger relatives are known to have lived until the last few hundred thousand years as well. 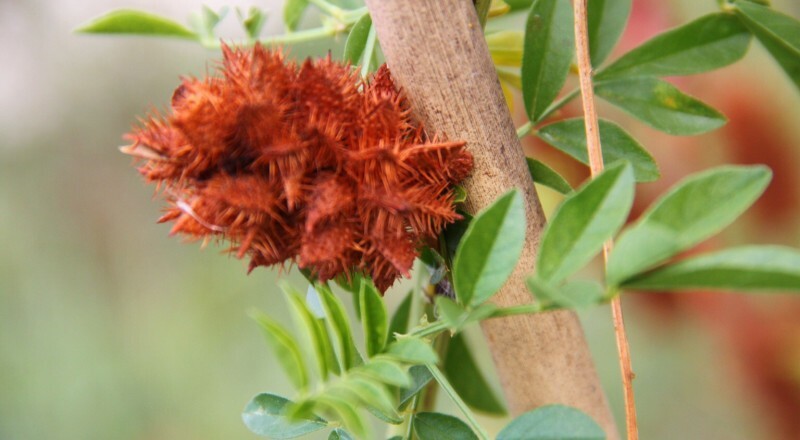 While the current species is limited in range to just a portion of Ethiopia, earlier species lived all across the old world — from the Mediterranean, to South Africa, to Morocco, to India. There are two subspecies — the Northern gelada (Theropithecus gelada gelada) and the Eastern gelada (Theropithecus gelada obscurus). 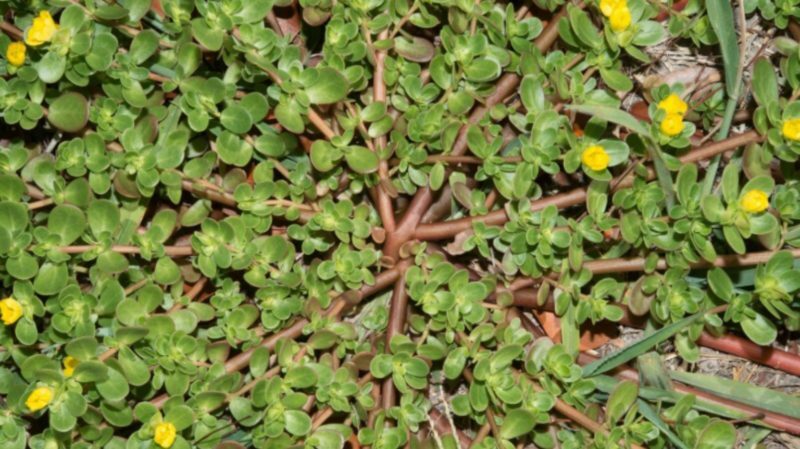 The rest of their diet is made up of flowers, rhizomes+roots, herbs, other plants, fruits, the occasional insect. Apparently during the dry season herbs are the preferred food. Worth noting is that geladas are “as effective” at chewing grasses as zebras are, according to researchers. They are typically of a large and robust build, with a hair-less face, and a hour-glass shaped patch of bright skin on their chest. Males typically average 40 lbs in weight, and females 25 lbs. Geladas are currently found only in the high-grasslands of the central Ethiopian plateau — living roughly 5900-14500 feet above sea level. At night they sleep near the edges of cliffs. They awake with sunrise and then travel to the tops of the plateaus to feed some, and to socialize. After a few hours of that, social activities tend to wane and foraging and travel become the general activities. Once evening arrives the geladas then descend back down to the cliff-edges to sleep. 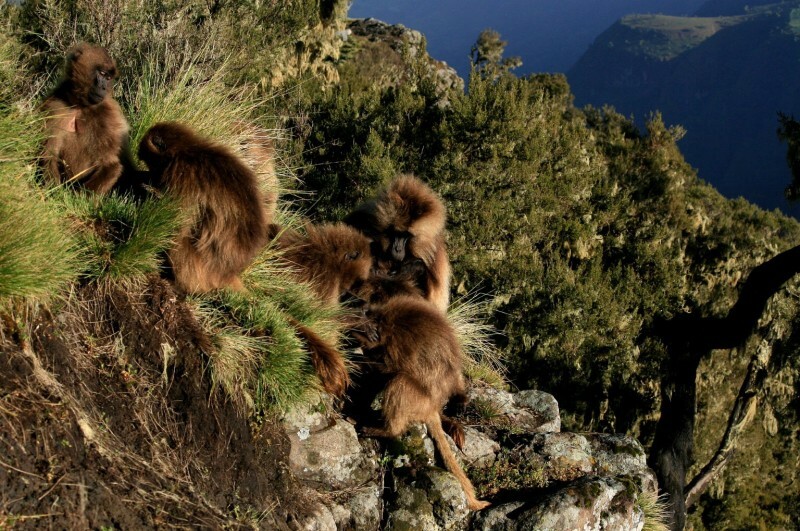 The social structure of geladas is very complex — and in many ways similar to that of hamadryas baboons. The smallest and most basic groups are the reproductive units, which are made up of one to 12 females, their young and one to four males, and the all-male units, which are made up of two to 15 males. The next level of gelada societies are the bands which are made up of two to 27 reproductive units and several all-male units. Herds consist of up to 60 reproductive units that are sometimes from different bands and last for short periods of time. Communities are made of one to four bands whose home ranges overlap extensively. Geladas typically live to ~20 years of age in the wild. Grooming and other social interactions among females usually occur between pairs. Females in a reproductive unit exist in a hierarchy. Higher-ranking females have more reproductive success and more offspring than lower-ranking females. Closely related females tend to have a similar hierarchical status. Females stay in their natal units for life; cases of females leaving are rare. Aggression is rare within a reproductive unit, being directed mostly towards members of other units. More often, the females start conflicts, but both males and females from both sides will join if the conflict escalates. Also, aggression within a reproductive unit is usually between females. 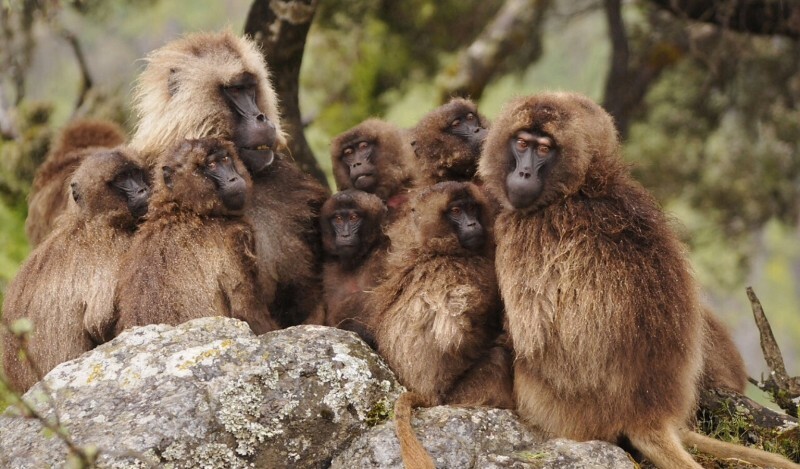 Nevertheless, gelada males leave their natal units and try to take over a unit of their own. A male can take over a reproductive unit either through direct aggression and fighting or by joining one as a subordinate and taking some females with him to create a new unit. The male maintains his relationship with the females by grooming them rather than forcing his dominance, in contrast to the society of the hamadryas baboon. Not all the females may interact with the male. Usually, one may serve as his main partner. All-male groups are generally aggressive towards both reproductive units and other all-male units. 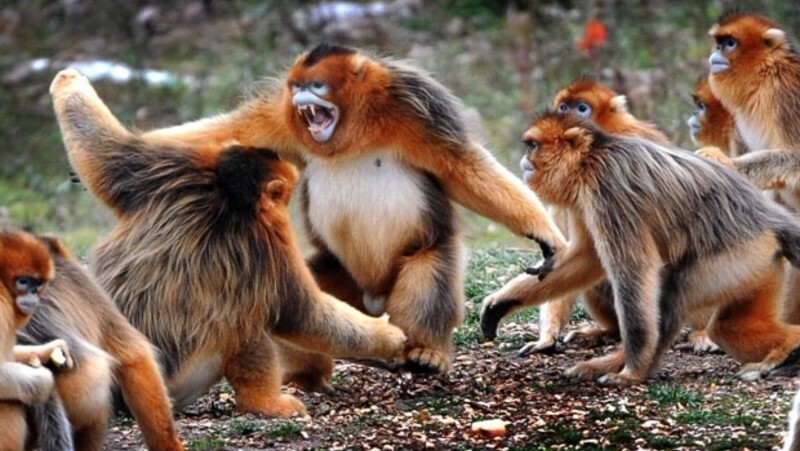 As in reproductive units, aggression within all-male units is rare. As bands, reproductive units exist in a common home range. Within the band, members are closely related and between the units there is no social hierarchy. Bands usually break apart every 8-9 years as a new band forms in a new home range. As far as communication goes, geladas utilize a highly-diverse range of vocalizations — including highly-distinct ones for aggression, reassurance, contact, solicitation, appeasement, ambivalence, and defense. It’s been noted that this level of complexity with regard to vocalization is comparable to that of humans. Geladas also utilize various forms of gesturing. While the species is currently listed as being of “Least Concern”, population numbers have been more than halved over the last few decades — largely as a result of expanding human settlements and agriculture. The golden snub-nosed monkey (Rhinopithecus roxellana) is a species of monkey native to the mountainous forests of central and southwest China. They live fairly high-up in the mountains and as a result are fairly well adapted to a relatively cold climate. They are also occasionally referred to as the Sichuan snub-nosed monkey. The species typically lives in groups that range vastly in size — from 5-10 individuals-strong groups, to groups of over 600 individuals. The social behavior of the species is quite complex. At night the species often forms what have been dubbed “sleeping clusters” — which are presumably a means of keeping warm. These clusters are usually made-up of females and their young, and other females — males typically sleep on their own, or on the peripheries to guard against predators. The golden snub-nosed monkey is now considered to be endangered — largely due to habitat loss, but other factors have played a part as well. Howler monkeys (genus Alouatta monotypic) are a genus of rather large, super-loud monkeys native to portions of South and Central America. There are 15 species in the genus, as currently divided. Deforestation, over-hunting, and the illegal wildlife/pet-trade are all currently playing a part in the fairly-rapid decline of the genus. As their name implies, they are loud. Their calls are loud enough to travel more than 3 miles through densely-packed tropical-forest. In fact, Howler monkeys are widely considered to the loudest land-animal in the world. Most of this guttural howling goes on around the times of dawn and dusk. The incredibly loud-sounds that they make are possible largely because of the enlarged basihyal (or hyoid bone) that they possess. In contrast to most other New World monkeys, both the male and the female howler monkeys possess trichromatic-color vision (similar to what humans see). Howler monkeys typically live 15-20 years in the wild. Another notable trait of the species is that juveniles of both sexes tend to leave the groups that they are born into, as opposed to just the males. During the Classical period of the Maya civilization, the species was considered to be the divine patrons of artisans — in particular, of scribes + sculptors. John Lloyd Stephens once described those living in the Maya ruins of Copán as being “grave and solemn, almost emotionally wounded, as if officiating as the guardians of consecrated ground”. Tamarins are New World monkeys (family Callitrichidae, genus Saguinus) that are roughly the size of a grey squirrel. Depending on the species, appearances can vary considerably — but most species possess notable “moustaches”. Lifespan in the wild is something of an unknown, but when in captivity they typically live up to ~18 years. Tamarins often live in large groups of up to 40 individuals — consisting of multiple families. Smaller single-family groups are also common though. As with many small primates, tamarins actually eat a fair amount of “meat” — in this case, lizards, spiders, insects, and bird eggs, are regularly consumed. The rest of the diet is made up of fruit and vegetation. Interestingly, adult males and juveniles assist in caring for the young. Long-tailed macaques have long been noted for their cleverness and ingenuity. But how many people would really guess that some populations of long-tailed macaque are actually quite skilled at fishing? To be particular, in Indonesia there are a number of groups that have been observed hand-fishing along various rivers in Indonesia’s East Kalimantan and North Sumatra provinces. Given the great flexibility of behavior that the species demonstrates, this observation of fishing behavior isn’t exactly surprising, but it certainly is notable. 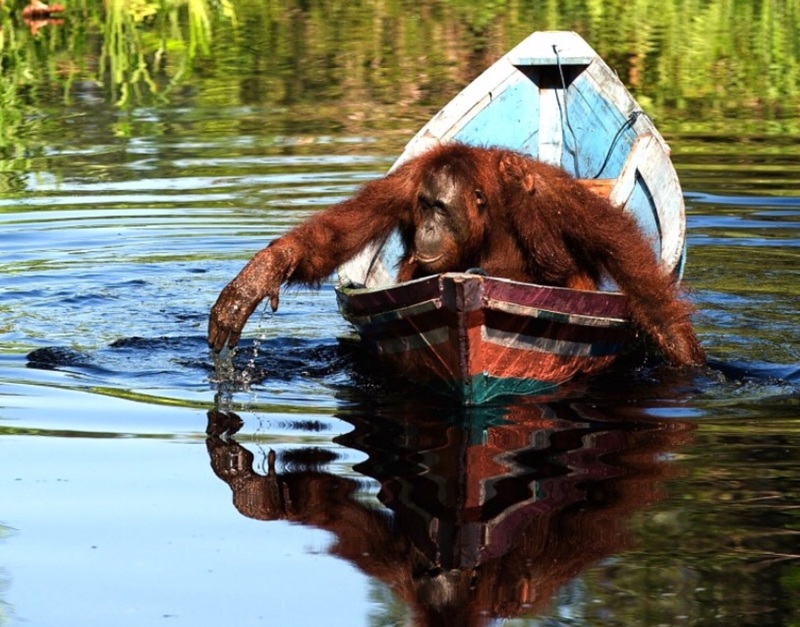 Other types/species of primates that have been observed fishing are: chimpanzees, orangutans, various baboon species, and the Japanese macaques. There’s a population/culture of chimpanzees in Guinea that has been repeatedly observed intentionally seeking-out and safely-disabling snare-traps throughout the region — while bringing juveniles along with them to observe. Given that said snare-traps — in common-use throughout the region by bushmeat hunters — are very dangerous, the behavior is quite interesting. This behavior — reported-on a few years ago in the scientific journal Primates — helped explain why chimps in the region were so rarely killed or maimed by snare-traps as compared to the chimps in other regions where they are regularly used. One adult male chimp heard a female chimp, accompanied by her one-year-old infant, whimpering next to a duiker carcass in a snare. 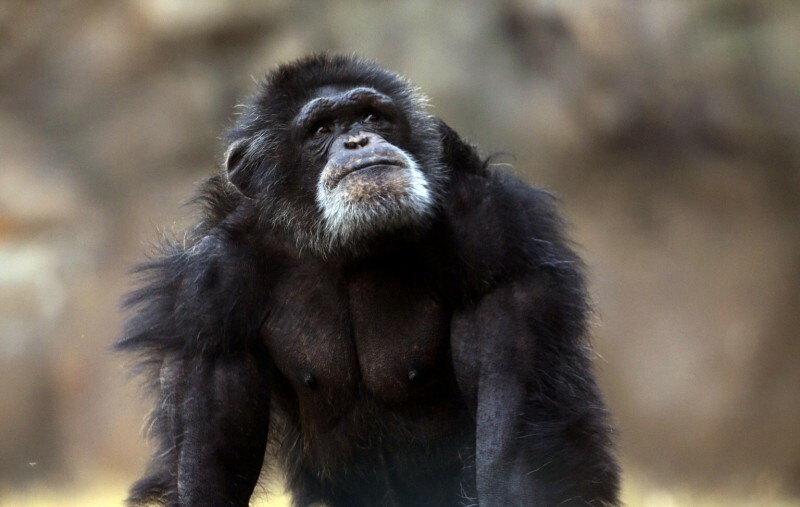 According to the researchers, the male chimp slapped the duiker, grimaced and then jumped away. He then grasped the snare with his hands and vigorously shook it. This same male had previously shaken another snare, causing it to break. Which is in stark contrast to most other regions where snare-traps are employed — in Kalinzu Forest in Uganda, for example, 10/16 identified-males had injuries from said traps. But not so in Bossou apparently, despite the use of the traps in the region.